Looking for more from your Racing Club? Our Racing Club can provide you with a real share in a minimum of two racehorses, with the ability to add to your 'stable' when new young horses come along. This is real ownership on a small scale. Why not take a tour of our stables from the air! Find out about our stables from a unique perspective. We run stables visits every 5-6 weeks right through the year for our Racing club owners. Our Racing Club sets out to provide outright ownership in two or more jump horses for a small monthly outlay. You will always have a minimum of two racehorses in the club at any one time. There are currently 43 memberships available in this Club. You will own ONE PERCENT in EACH of the current TWO racehorses in the Club, which means you will benefit in direct proportion to that percentage from any prizemoney the horses earn. Only 50 members maximum - this will keep the Club personal and also mean we can take as many owners racing as possible with Owners badges. 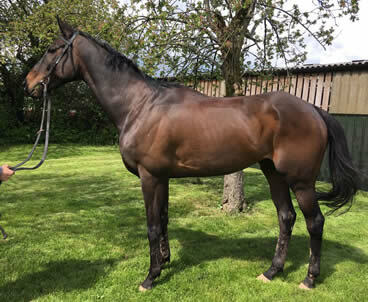 Two jumps racehorses - Tommy has chosen two National Hunt bred horses - a youngster who could be anything and an older horse to guarantee runs and days out at the races. Real outright shares - if you join the club you will own 1% in each of the horses. Clear pricing - There is NO UPFRONT FEE! It's just £59.95 per month ongoing which covers absolutely everything for your two horses. We will never ask for anything more, so no vets fees! We smooth out the costs over the year, so we do insist that your minimum initial membership in the club is 12 months. Want to pay for the entire year in one go? That's fine - we have that option at the checkout. Your share of any prizemoney - If your horse wins prizemoney, you win! Your online account is credited immediately and prizemoney is paid out at the end of each season (August 31st every year). Professional management - We use the SyndicateManager.com online system to manage all entries, declarations, reports, photos and video and we will make sure you miss nothing. Stable Visits - We hold stable visits every 4-6 weeks just for Members. We will advertise the visit dates in your account and by email. Membership as a Gift - If you wish you can buy and then give the membership to a lucky friend or relative! Do so for a year, or ongoing. Membership certificate - You'll receive an emailed certificate of ownership, plus a profile of both horses and your login to our website once your order has been confirmed. Minimum two horses at all times - If either club horses suffers a season ending injury, we will replace them until your horse returns to fitness. 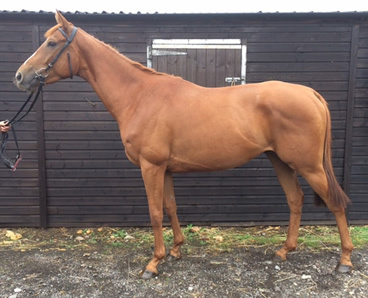 A young National Hunt bred gelding, a strong young horse with plenty of scope. A grand handicapper, Keppel Isle will run regularly and should provide plenty of excitement. We are really looking forward to our five-year-old gelding getting going in the summer of 2018. He's a well bred, good looking horse and will hopefully be a proper racehorse. You can read their profiles here. Or view their pedigrees. Once you have joined, we will email you to confirm your payment. You will also received a separate welcome email within 24 hours which will have a document attached which provides full information about the horses, the club, and how to register for yard visits and owners badges. It will also contain your login details for your Ownership Account. This PDF document can be printed out and given as a gift if you wish. It is the objective of the club to race the horses for more than a single season. All monthly fees are non-refundable. Free or discounted Owners badges cannot be guaranteed for every race meeting - we will always do our best and use a rotation system to be fair to everyone with the allocations. A dividend will be paid by Paypal or Cheque once a year on August 31st assuming the horses have won prizemoney or there are profits from the sale of horses, less any sales costs. If you wish to leave the club you may do so at any time after the first 12 months of membership - just let us know and cancel your Direct Debit. Non-payment of monthly fees during the first 12 month term will cancel your Ownership immediately and you will forfeit any prizemoney or proceeds from the sale of horses. Tommy has gained a reputation for taking value purchases and winning races with them. He also works closely with breeders aiming to maximise their stock value. The yard also works with syndicates, as well as running its own syndicates. We pride ourselves on the service we give our owners regardless of the size of share you may own. Tom is a hands-on trainer and regularly rides out himself. © Tom Gretton Racing 2019. All rights reserved.